Emily Long is a freelance writer based in Salt Lake City, Utah. She covers personal finance, tech, and security, and her work has appeared in Tom's Guide, NBC News, Lifehacker, and LearnVest. Nearly 90 percent of all homeowners have 30-year, fixed-rate mortgages, according to Freddie Mac. It makes sense why — a home is the single largest purchase most adults will ever make in their lives. Spreading out payments over three decades not only allows you to have an affordable monthly payment but also gives you enough room in your budget for other expenses that come with homeownership, like property taxes and maintenance. But when you sit down and really think about paying off a loan that big for that much time, you start to realize just how many thousands — if not tens of thousands — of dollars you’re wasting on interest payments that go directly into the bank’s coffers. If you’ve applied for a mortgage recently, you should have gotten something called an amortization schedule with your loan disclosure. 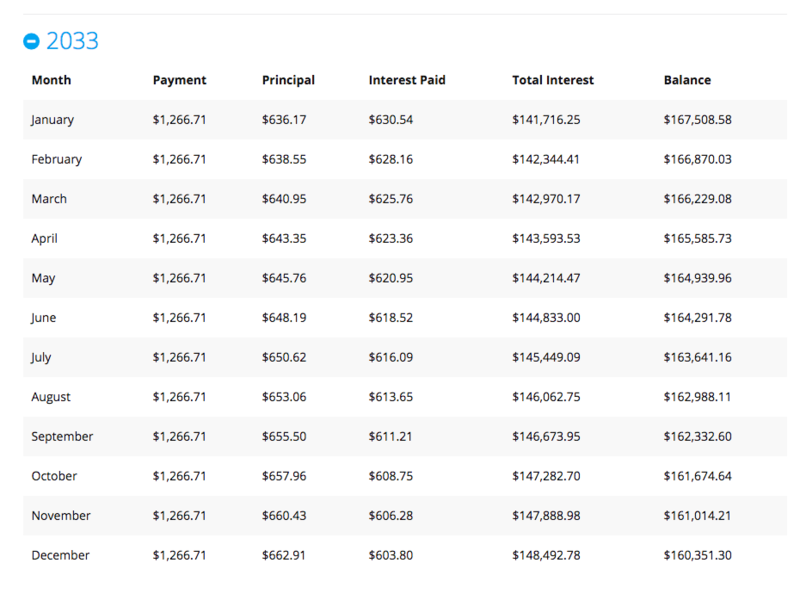 This schedule shows you how much of your monthly payments are going toward your principal loan balance and how much are going toward interest over the entire life of your loan. In most cases, the majority of your early mortgage payments will almost entirely go toward interest — meaning you’re hardly paying down your mortgage principal at all! And so long as your mortgage balance isn’t going down, that means you are barely building equity in your home. Instead, that money is going straight to your lender. This pattern continues for several years, and slowly but surely, less of your monthly mortgage goes toward your interest and more goes toward your mortgage principal. You can easily calculate this for yourself using the LendingTree mortgage payment calculator. In the example below, let’s say you’ve borrowed a $250,000 for a mortgage at a 4.5% interest rate. 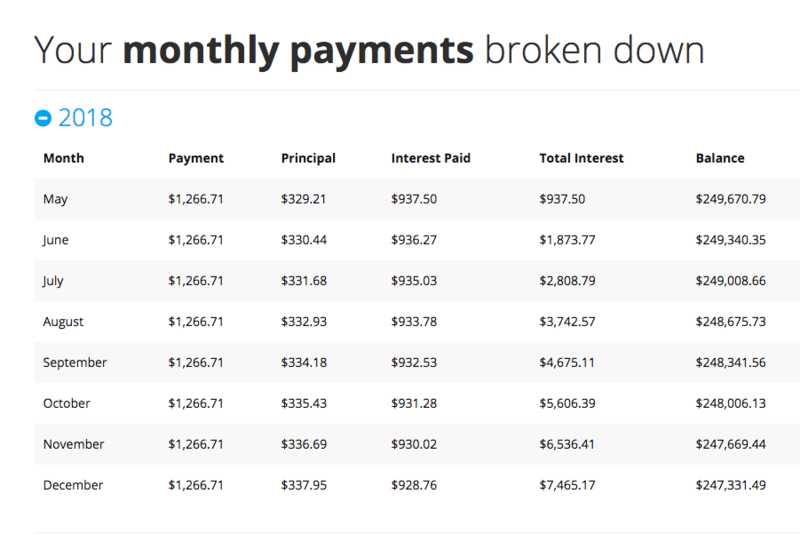 In the first seven months alone, about $330 of your monthly $1226 payment is going toward your principal balance, while the bank gets to walk away with about $930. Ouch. Want to hear the truly painful part? That balance doesn’t start to shift for another 15 years! It’s not until the year 2033 that a larger share of your mortgage payment goes toward your principal vs. your interest. Fortunately, there is a simple way you can speed up that process. If you have a higher income or more cash on hand than when you applied for your loan — or simply want to own your home outright in less time — you can make additional principal payments each month to pay off your mortgage faster. Before you make any changes to your payment schedule, however, find out if there are any prepayment penalties associated with your loan. In most cases, these penalties apply if you pay off your entire mortgage balance in a short period of time — three to five years — but can also be assessed if you pay off a significant chunk of your balance at once. Not all mortgages have prepayment penalties — if there is one attached to your loan, you agreed to it when you closed on your home. Check with your lender if you’re unsure. If you decide that it is in your best financial interest to pay off your mortgage early, here are eight strategies to help you get there. With most loans, including your mortgage, the likely default is to make a single monthly payment or 12 payments per year. If you split that monthly total in half and make a payment every two weeks, you can actually pay down your loan more quickly and save a significant amount in interest. Here’s how it works: Because there are 52 weeks in a year, a biweekly schedule adds up to 26 payments — the equivalent of 13 monthly payments in the same amount of time. The table below shows the cost of a 30-year, $250,000 loan with 4% interest if you make 12 monthly payments versus 26 biweekly payments. With this example, you’d save $27,381 and cut four years off your term by switching from monthly to biweekly payments. Before you switch to biweekly payments, find out if your lender offers this plan, whether they use a third party to manage it and if there are any setup or transaction fees that could offset any interest savings. In 2015, the Consumer Financial Protection Bureau sued a national mortgage lender for misrepresenting fees and savings opportunities to consumers who enrolled in their “Interest Minimizer” biweekly payment program. Even if your lender doesn’t offer a specific bi-weekly payment program, you could make a single additional payment each year, or divide that extra payment into your existing 12-month plan. Another strategy is to make higher payments each month and put the extra toward your loan principal, which will significantly reduce the time it takes you to pay off your mortgage as well as the amount of interest you owe. But you have to explicitly tell your lenders to apply your extra payments to your principal vs. your interest. Notify your lender via phone call or a written letter of instruction to put that extra cash toward your principal. Some lenders may make it easier than others, including an option on your monthly bill to apply the payment to your principal. Using the same example as above — a 30-year, $250,000 loan with 4% interest — you’d save $84,910 and cut the term of your mortgage nearly in half if you paid an extra $500 each month toward your principal. Refinancing into a shorter loan term is perhaps the most straightforward way to speed up paying off your mortgage — but there are caveats. How it works: If your original loan has a 30-year term and you have 25 years remaining, refinancing into a 15-year term means you pay off your mortgage 10 years faster than you originally planned. When you refinance from a 30-year to a 15-year loan, your monthly payments increase, but you pay down your principal more quickly without having to calculate special or additional payments — and you’ll owe significantly less interest thanks to the compressed time frame. Before you move forward with this option, consider that the process of refinancing is not free. You’ll pay your closing costs all over again, including application, appraisal and attorney fees; a title search and credit report pull; and other fees required by your lender. Depending on your financial situation and how long you plan to stay in your home, refinancing may not be the best option. If you are approved for a lower interest rate, you can refinance to another 30-year term with a lower monthly payment than your original loan. Then, take the difference between your previous monthly payment and the new one, and apply it toward your principal just as you would if you were paying an extra $500 every month as in the example above. You’ll still spend the same amount out of your pocket, but you’ll pay down your principal more quickly and reduce the amount of interest you owe over time. The table below shows the same 30-year, $250,000 loan at 4% interest, but if you refinance to a 3% interest rate after two years, you’ll pay your mortgage off in just under 25 years and save $80,123. Again, as with any refinance, don’t forget to account for closing costs. Instead of putting extra cash directly toward your home loan, invest it using a strategy as conservative or aggressive as necessary to produce a higher rate of return than your mortgage for the amount of time which you’d like to pay off your loan balance. For example, you calculate that an extra $1,000 per month would result in your 30-year mortgage being paid off in 15 years — and you have the disposable income to afford that monthly expense. If you invest the extra $1,000 in a brokerage account, it’s possible that in 15 years you’ll have enough money to pay off your remaining mortgage balance with a substantial amount left over to put toward other financial priorities. Markets are volatile and there are no guarantees that you’ll get the rate of return you expect — you may even lose money. So why take the risk? Steve Burkett, a certified financial planner with Palisade Investments in Bothell, Wash., says investing for wealth can do more than just help you pay off your mortgage faster. If your investments are in an accessible account, they can also serve as another type of emergency fund in addition to your standard savings account. Once you pay off your mortgage with this account, you could potentially have additional assets on top of owning your home outright. “You can pay off your mortgage, still retain some control over your money along the way and then pay off your mortgage in one big payment when it suits you,” he added. If you don’t have the cash flow to pay more on a biweekly or monthly basis, you can still make occasional extra payments toward your principal. For example, when you receive your tax refund or year-end performance bonus, allocate part or all of those funds for an additional mortgage payment. If you and your spouse or partner both receive bonuses, put one toward your loan and the other toward other financial priorities. If it’s money you aren’t counting on in your day-to-day budget, direct it straight into debt repayment or investments. Again, like in the examples above, ensure any extra payments are put toward your loan principal. Another option that will likely have a minimal impact on your budget is to round up your monthly mortgage payment. Marguerita M. Cheng, a certified financial planner and CEO of Blue Ocean Global Wealth in Gaithersburg, Md., works with clients who add a few extra dollars to their electronic payments or simply round up their monthly mortgage checks. “I’ve seen clients do as little as round up from $1,810 per month to $1,900, to as much as an extra $1,000 per month,” she said. Most debt repayment strategies require careful budgeting and prioritization to determine how to allocate available cash. Your mortgage is no different — if you wish to make additional payments and close out your loan more quickly, take a hard look at your spending to see if there’s a way to make more or cut back on expenses. Cancel one of your streaming subscriptions, dine out less and, if you have the space, consider taking on a roommate to help offset your monthly mortgage payment. Experts agree that just because you can pay off your mortgage early doesn’t mean you should. If you have the cash to make extra payments but lack an emergency fund, aren’t maxing out your retirement contributions or have other higher-interest debt — credit cards or student loans — then it may make more sense to direct those funds elsewhere. In addition, interest rates for many homeowners are rising but still relatively low, so you should calculate the cost of borrowing for each form of debt to help determine whether paying down your mortgage is the highest priority. Before you move forward with any of these strategies, consult your lender and your financial planner to determine if paying your mortgage off early is the best step for you. The Federal Reserve stops hiking interest rates. Will mortgage rates go down? Do No Income Verification Mortgages Still Exist?